Bison Stats: Bordowski 4+0, Tait 1+2, Sampford 1+0, Klejna 0+2, Morris 0+2, Jones 0+1, Petts 0+1, Ralph 0+1. Raiders Stats: Huska 1+2, Chong 1+1, Ayliffe 1+0, Scott 1+0, Wells 1+0, Baldock 0+1, Jackson 0+1, Sylvester 0+1. 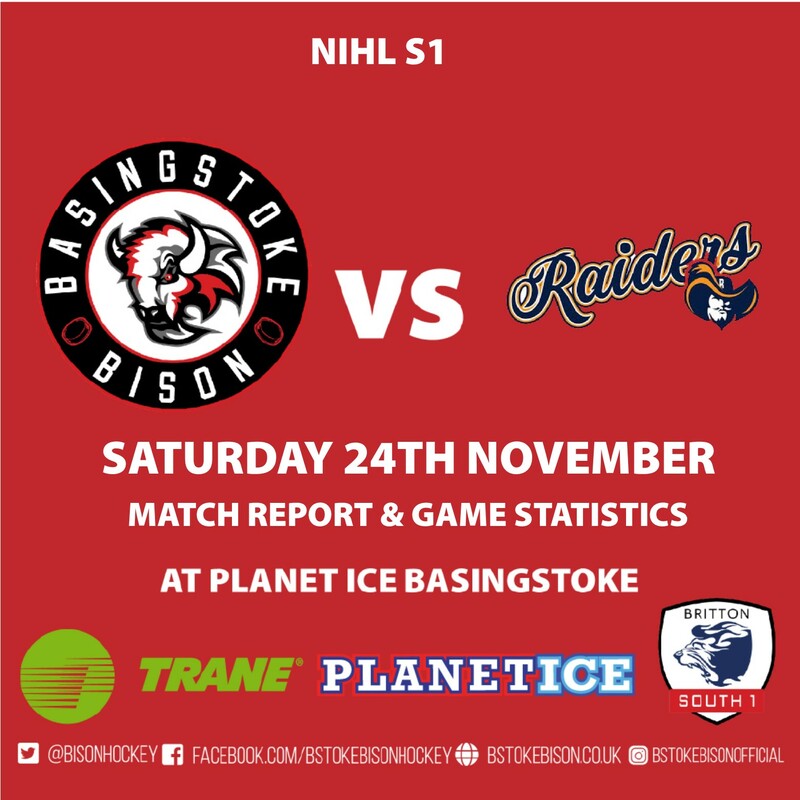 The game started in the best possible way for the Bison, when Player/Coach Ashley Tait buried the puck into an empty net, after a great move & pass from Michal Klejna, as he'd drawn Raiders nettie Ben Clements out of position. The goal was timed at 1.41. Paul Petts also getting an assist on the goal. The period was played at a high tempo, with both teams cancelling each other out, when it came into goal scoring positions. Klejna had a couple of chances later on in the period, but Clements was equal to both shots and the period ended 1-0 in favour of the home team. The 2nd Period started pretty much the same, with both teams negating each other�s opportunities. Bison thought they'd scored again, Chris Cooke appeared to keep the puck in the zone and the puck eventually ended up behind the Raiders goalie, but the lino whistled to say the puck had gone out and the goal wouldn't count. I honestly believe he whistled prematurely, thinking the puck would come out. After a few heated discussions, the game continued. Then there was a scary moment for Bison players/fans alike, as Jay King took a redirected puck, which appeared to hit his face and he slumped to the ice. The players around him were calling for the medic to get on as soon as possible. By the time he'd made his way out there, Jay had got back to his feet. It wasn't as severe as first thought and he skated off under his own steam. Jay is one tough cookie! At 28.10, Raiders tied the score. Liam Chong collecting his own rebound off the backboard, to fire the puck behind Mettam. Jake Sylvester collecting an assist. Raiders were growing in confidence and were getting more into the game, but Bison appeared to be losing momentum. Raiders then took the lead at 31.13, much to the delight of their bench. Juraj Huska collecting the puck on the point, off a face off win by Liam Chong and he fired a shot in on Mettam, which beat Alex, who appeared to be screened. Then a Too Many Men penalty was called on the Bison by Flynn Sitch-Cunningham. Bison players & the bench were furiously trying to explain that it wasn't, but referee Belfitt awarded it and Josh Kelly skated across to sit the penalty. Then after another deliberation, the ref skated across and cancelled the call. It was a strange moment, but it appeared to be the correct call. Things were going to get worse for the Bison though. At 33.08, a goal mouth scramble led to the puck looping over Mettam and into the net. Callum Wells was credited with the goal and Baldock got the assist. A few seconds later (33.15), Raiders Matt Turner took a Hooking penalty. Bison went on the Powerplay trying to cut the deficit, but Ashley Tait was awarded a minor Boarding call and then unfortunately, also collected a 10min Misconduct call for his troubles, timed at 33.52. It was going to get worse for Bison. Liam Morris, returning back to the line-up after a few weeks out, found himself through on goal, only to be brought down, he managed to still get a shot off, but there was no call coming. As he skated back to the bench, he banged his stick against the plexi in frustration and up went Belfitt's arm. A 2min Abuse of Official call, timed at 35.10. Raiders found themselves with a two-man advantage, which they took full advantage of. At 34.59, Dan Scott with a sweet wrister, lit the lamp and it was 4-1 to the visitors, much to their joy. Huska picked up an assist on the goal. During the period break, I just sat there in disbelief of what I had just witnessed. I imagine the locker room was not a place you'd really want to be right now!! The guys came out for the start of the 3rd. How was the next 20 minutes going to pan out? Were we going to crumble even more or could we at least, try and get a goal, just to make the scoreline, look slightly better........? It didn't start too well, as Danny Ingoldsby was called for Holding at 41.50. Bison saw off that penalty and returned to full strength. Bison finally managed to find the net again, Richard Bordowski stabbing home the puck, after Liam Morris had seen his shot saved by Clements. Goal timed at 46.34. Into the last 10 minutes of the game, could Bison get another goal. Raiders took a penalty at 50.20, when Callum Wells was called for Interference on Danny Ingoldsby. Bison couldn't make the man advantage count and Raiders returned to full strength, well for at least 3 secs. Ex Bison Captain Aaron Connolly, getting a Hold the Stick penalty at 52.23. This time Bison would make the man advantage count. Bordowski again scoring, with assists from Morris & Sampford, timed at 52.46. The scoreline now reading 5-3, could the Bison get another. The answer was yes. Bordowski completing a straight hat-trick at 54.04. He collected the puck from Tommy Ralph on the left wing, skated into the Raiders zone & then he drove to the net using his speed & strength to hold off the Raiders d-man & fired the puck past Clements. The fans went wild actually believing we could possibly pull this off. Raiders players were feeling the pressure Bison were exerting now and this resulted in them calling a time out, just to try and re-group. There was still plenty of time to find that all important game-tying goal. At 56.04, Alex Mettam was awarded a Slashing call, but Bison dug in deep and successfully killed off the penalty. With time running down, it was getting so tense. The final 2-minute call was announced and we were still no closer to getting the goal we so badly needed. Into the last minute and we were struggling to get possession of the puck. Fortunately, a poor pass from the Raiders, caused an icing call and Bison called their Time Out. With 27.5 secs left on the clock, it was all or nothing. Alex was pulled for the extra attacker. Bison fans willing the guys to win the face off and at least get a shot on target. Bison did win the draw and got a shot off, but it wasn't on target, Raiders tried to clear the zone, but the puck just found Tait on the point and he fired it back in, it hit Klejna and the puck bobbled free and then Alex Sampford buried the puck and the place erupted, Bison had pulled off one of the most exciting fightbacks, but this was just to get a tie the game. Goal was timed with 17.5 secs on the clock. Klejna & Tait getting assists on the goal. Bison almost stole it at the death when Adam Jones shot from the point almost beat Clements, but the buzzer went for the end of the period. What a period of hockey that was, but there is now the small matter of the extra point, which at the end of the 2nd period, we didn't even deserve. Into Overtime then, Bordowski, Cowley & King lining up for the Bison, whilst Jackson, Aaron Connolly & Dan Scott were Raiders starters. As always in overtime, play usually starts off slow, just trying to create that little gap that ultimately could win you the game. The first shift couldn't achieve anything so our second unit came out, Jones, Tait & Bordowski. Adam picked up the puck on the right, managed to cut inside, passed the puck to Ash who got a soft shot off, but he carried on, picked up the puck behind the net and somehow backhanded a pass in front of goal, where that man, Richard Bordowski was waiting to smash home the puck and complete the unthinkable & win the game. The bench & fans alike erupted again, but even louder than before. They had just witnessed one of the most remarkable comebacks, from 5-1 down, to win the game 6-5 in Overtime, which was quite sensational.